Kelcie Ball steps into the ring for his next challenge – against Londoner Jordan Grannum – admitting he has no clue about his opponent. But that isn’t because the 26-year-old, from Nuneaton, hasn’t been doing his homework! instead he deliberately avoids researching his adversary – a tactic he says works with eight wins in eight. 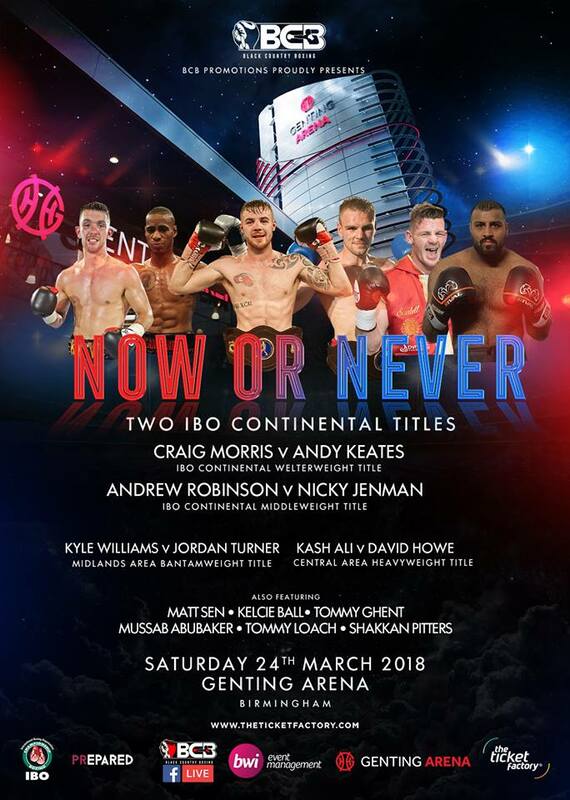 Ball is in action at the Genting Arena on Saturday as part of BCB Promotions’ ‘Now Or Never’ Show sponsored by BWI Events. Ball explained: “When I made my debut I spent weeks researching my opponent until I knew everything about him. “But all that did was made me more nervous as I knew what to expect. I won but I hated feeing nervous. “I go into this fight on Saturday after a 12 week camp rather than an eight week one,” he said. “I’m in the fittest shape of my life and really looking forward to fighting at the Genting in front of the biggest crowd I’ve faced. “I’ve had extra time for sparring extra rounds and worked more on the pads so I’m really raring to go now. “There’s talk of a Midland area fight straight after this in May for me and if I can go on and win that then it’s English, British titles who knows – it soon propels you up the rankings. Two IBO Continental fights top the bill as Ludlow’s Craig Morris defends his welterweight title against Leek’s Andy Keates whilst Birmingham’s Andrew Robinson battles Brighton’s Nicky Jenman for the vacant middleweight crown. A whole host of local prospects – Tommy Ghent, Mussab Abubaker, Shakkan Pitters and Tommy Loach – also feature.